Engineered and comprised of a series of patented connections, the Supaloc system is unmatched in its strength and performance. In contrast to traditional building methods of hammer and nail, each and every component in the Supaloc system connects seamlessly and is bolted together for the ultimate level of strength. Supaloc is the only framing system that utilises unique patented brackets to attach the critical components of your frame together and bolt them to the slab. 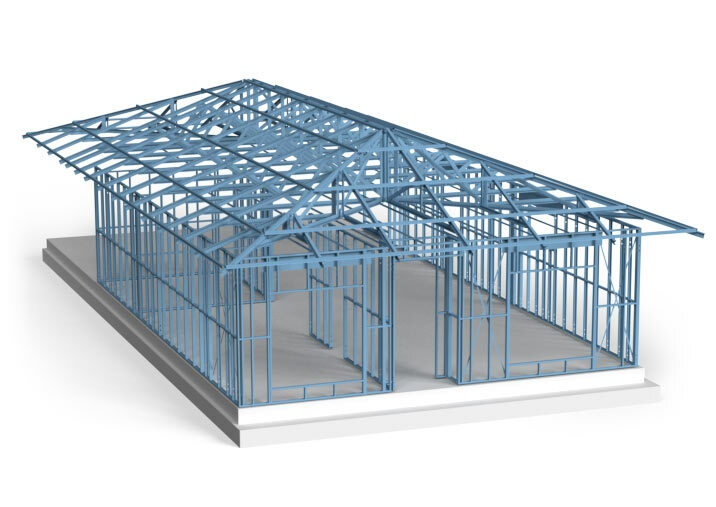 The roof is attached to the truss , which is attached to the wall frame, which is attached to the slab, giving you complete security even in the most severe weather conditions. Each frame is manufactured from BlueScope TRUECORE high tensile light gauge steel and is backed by a 50 year written warranty* giving you absolute peace of mind! The trusses are designed for roof loading conditions, taking into account known wind speeds and dead and live loads specified by an independent engineer. This includes but is not limited to ceiling, cladding and racking forces with regards to the job specific conditions. Additional items contributing to truss loading require special consideration, including but not limited to solar units, hot water tanks and air conditioning. Supaloc should be advised prior to commencing design of the truss system of any additional load requirements. If in doubt please contact Supaloc directly.